The administrative user panel provides at-a-glance information and useful tools to help you manage your users. To access the administrative user panel, click on Users in the top navigation after you have signed in. Once you have navigated to the Administrative user panel, you’ll notice that the Administrators tab will be activated automatically. Please note that student users are accessed separately by clicking on the “Students” tab. You will also see Send Email Invitation, Export User List, and Remove Selected Members buttons. These three options are inactive until users are selected. All users are listed at the bottom of this page and may be sorted, filtered, and exported in a variety of ways. There are a variety of options available for sorting your administrator list. Below your admin user statistics, you’ll see a full list of your admin users with a variety of options for filtering, sorting and selecting. You can Search (1) by last name, first name, or email address in the search field. Aqueduct’s admin user panel allows you to Filter by Role and Filter by Status. 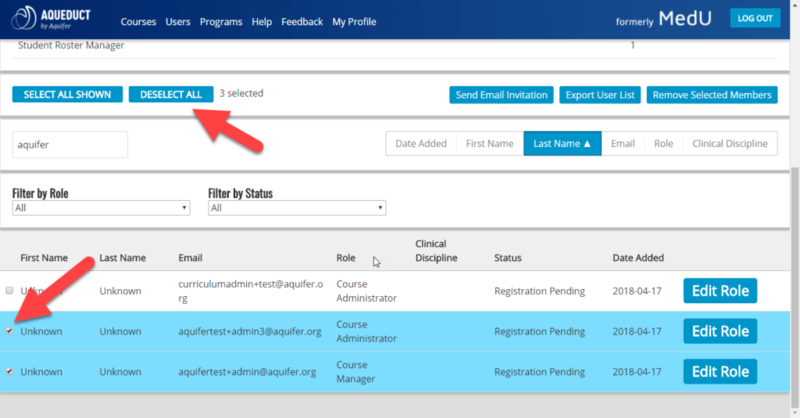 Use the dropdown menus to sort the list of admin users below by Aqueduct role assignment or registration status. You can also sort in ascending or descending order by first name, last name, email, role, clinical discipline, and date added (2). Please note first name, last name, and clinical discipline is entered by users when they complete their registration and will not be available for administrators who have a status of “Registration Pending”. The role field indicates the role assigned to the user in Aqueduct. To sort, click on the button for the field you wish to select (3). The button you select will turn a darker blue while your sort is active, and a pointer will appear next to the text indicating if your list will be sorted in ascending or descending order. Click the button again to change the sort order. In order to use the administrative user management tools, you will need to select a user, or group of users, you wish to manage. After using the filter and sort options to display the list of users as you’d like, there are two methods to select and deselect students. Check the box next to each administrator you wish to select. Check the box again to deselect. Selected admin users are highlighted, and show a checkmark in the box next to their name. Our user management tools make it quick and easy to edit and export users, or send email reminders to your unregistered users. Changing the role assigned to an administrative user is easy. Next to the user you want to edit, select the Edit Role button. This will open a page entitled Edit Role for [user’s name]. Choose the appropriate role from the drop-down menu by clicking on the up and down arrows. Click Update. Note: If your program already has the maximum number of users for a role (viewed form the main user panel), you will not be able to add additional users in that role. 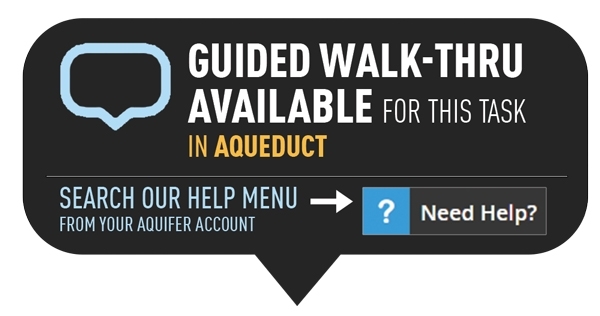 Please contact Aquifer support for assistance. Email invitations can be sent to administrative users with a Registration Pending status at any time. Please note that all admin users automatically receive an email invitation when they are initially added to the program. You may wish to send reminders to administrators who have not signed in to access your course after a few months, or a period of time that fits with your program’s schedule. Email invitations will ONLY be sent to users with a Registration Pending status. 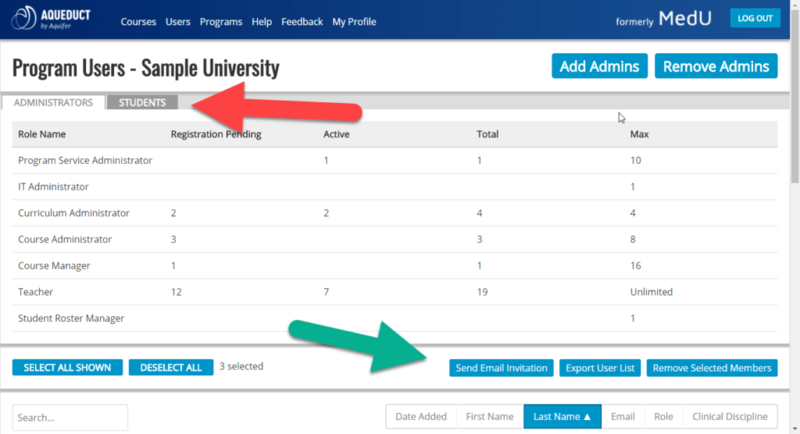 To send an additional email invitation, select the users you wish to email, and click the Send Email Invitation button. You will receive a pop-up prompting you to confirm that you wish to send an email to the selected users. Click OK to continue sending the email invitation. After emails are successfully sent, you will see a confirmation note in the light blue box at the top of the page. Please note: Emails will not send to users with an Active status. If you select users with a mix of statues, emails will send to only those who have not yet registered. After clearing the pop-up, the message at the top of your screen will show which emails were sent to users. To export a list of users to a csv file, select the admin users you wish to export and click the Export User List button. Your browser will direct you to download and save the csv file for your use. 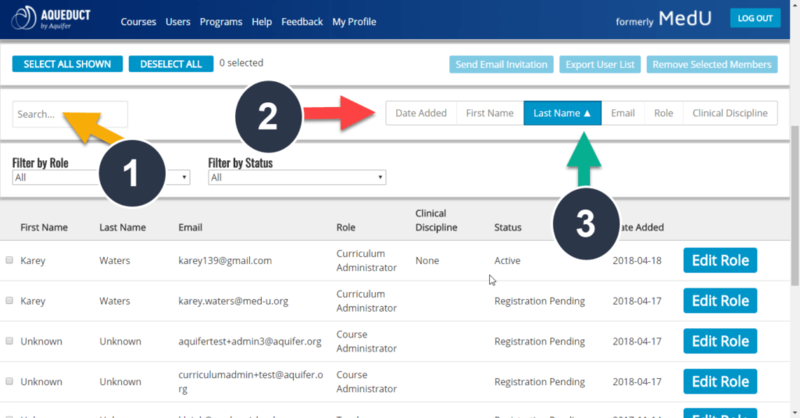 Removing admin users from your program will discontinue their access to your Aquifer courses and reporting. There are two ways to remove admin users from your program. To batch remove admins using a list of email addresses, click the Remove Admins button at the top of the page. On the Batch Remove Administrators from Program page, add emails (comma separated) for the users that you wish to remove from your program and click Remove Administrators. You will receive a pop-up message asking to confirm the removal of the listed administrators. Click OK to confirm that you wish to proceed. After the process completes, you will see a confirmation in the light blue notification bar at the top of the page. You can also remove administrators by selecting them from the user list, and clicking on the Remove Selected Members button. The options for sorting and filtering your user list allows for efficient use of this method for removal. You will see a pop-up notification asking you to confirm deleting the selected users. Click OK to continue. After the process completes, you will see a pop-up confirmation. Once administrators are removed from a program, they are no longer able to access Aquifer courses or reports.